Beautiful blueprint from the Improvement in High Lift Wing Construction & Control dated 9/8/1933. This item is over 78 years old. 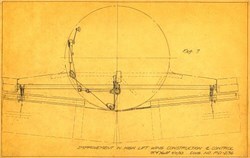 At the bottom of the drawing it says "High Lift Wing Construction & Control" hand signed by inventor R.H. Hall. This drawing was used for one of Hall's many patents while he was working for the Thomas Morse Aircraft Corp. The company was eventually acquired by Bell Helicopters. Randolph Fordham Hall was an aeronautical engineer and inventor, began work as a draftsman at the Thomas Brothers Airplane Co (1915-16) and moved to Standard Aeronautical Corp as an engineer (1917). He enlisted in the US Army Air Service Technical Service (1917-19), advancing to the rank of sergeant first class. During this time he attended the American Expeditionary Forces University in Dijon, France, where he earned degrees in mathematics and mechanical engineering. He returned to the US, becoming an assistant engineer at the Thomas Morse Aircraft Corp. (1920-28) before joining Francis E. Cunningham and James C. Dryer to form Cunningham-Hall Aircraft Corp. (1928-41). He left Cunningham-Hall to join Bell Aircraft Corp. (1941-59) where he remained until he retired. Hall received over forty patents during his career, including a patent for a high lift wing which flew on Cunningham-Hall's entry in the Guggenheim Safe Airplane Competition of 1929.